How extremely relevant are MacArthur’s words, not just for a post WWII America, but for a 2018 America? In their own way, Thomas Jefferson, Dwight D. Eisenhower, Ronald Reagan and others have vocalized the same sentient concern regarding the destructive potential of negative internal forces. Internal forces often exceed external forces in their destructive aspect. As powerfully as MacArthur’s words ring true in a national sense, do they not also ring true for each of us in a personal sense? What about the internal threats affecting each of us that are of our own making? How do our personal moment-to-moment thoughts and actions reflect on our own security? Do we make wise decisions in our life? Do we seek balance in all things? Are we centered? Do we lack discipline and self-control? Do we take life by the horns or let the horns of life impale and disembowel us? Do we make our own decisions or blindly follow the directions of others who are not concerned with our overall well-being? Do we secure ourselves against our own self-inflicted wounds, injuries, problems, turmoils, sufferings and sorrows? After all, this is our life and it is our responsibility and no one else’s. Karate teaches us many valuable lessons in life. 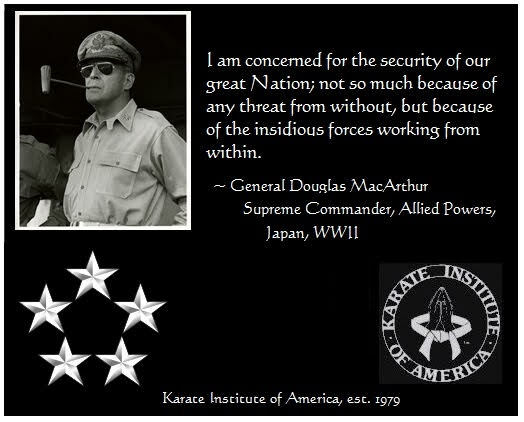 In keeping with MacArthur’s cogent concerns regarding security, we must remember that external threats, although valid, may not be the core of our own problems. Rather, they may well be the insidious forces working within each of us that are the root of our greatest dangers. © 2018, Richard Andrew King, Grandmaster - Karate Institute of America.